This is a simple and delicious recipe that my mum created when she had a Tapas Bar beside a river in my town. 4 big potatoes,"agria" are the best. 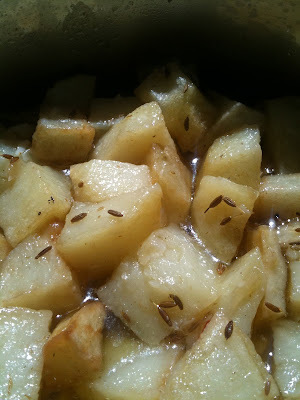 Deep fry the potatoes, turn them as needed until they are cooked. Then, place them in a sauce pan, set aside. Now put the oil from the frying pan in a jar (you can use this oil next time) but not all of it. We need some of it (approx. one cm deep) to make the sauce for the potatoes. Leave the oil in the frying pan to cold. In the meantime mash the garlic, Chilli and cumin in a mortar (you can use a blender if you like). Make sure the oil is cold and add the vinegar, 1 glass of water,and the mix. Bring to boil and salt to taste. Add this sauce to the saucepan with the potatoes, mix a bit and bring to boiled for 5 minutes, covered. Now you just need to wait for a couple of hours until the potatoes absorb the sauce. Delicious and very easy! Just make sure you add salt.